Secure Horizons Protective Services Inc. Secure Horizons Protective Services is a Los Angeles based company that provides security guard services throughout California. Every Customer receives personalized security service and direct contact with our management team. Each and every assignment we undertake will have custom written post orders prepared based on their specific needs. With this approach, we can assure the highest quality of service to every valued client. 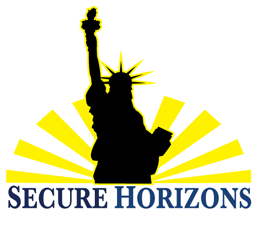 With over 25 years of security industry experience Secure Horizons Inc., has the expertise to meet your security needs. Because society is forever changing our officers continue training in the latest security enforcement techniques and are kept up-to-date on the latest California laws passed, to better protect you, your business, and your property. Maintain an update the security procedures manual, commonly known as "Post Orders"
Upon award of a contract, a supervisor will be assigned to your facility to coordinate operations. His or her responsibilities include hands-on training of new employees and on-premise inspections. The supervisor will also ensure that all personnel follow company regulations, instructions, and maintain their areas of responsibility at the optimum level. California Bereau of Security and Investigative Services (BSIS) Licensing Verification-Of all applicants supplying or claiming a valid private security guard license. Once awarded the security contract, a member of Secure Horizons Protective Service Inc. will create a full set of detailed post orders that defined the duties expected of the security officer. This forms the cornerstone of our off-site training for your facility that incorporates instructions with role-playing between instructor and student. When personnel are assigned to your facility, the supervisor will conduct an on-site “walk-through” to assure that the training was thorough and every aspect of the day to day management of your facility is met. Through the process of close supervision we are able to maintain a constant line of communication with our officers, supervisor in the field, the client , and the main office. Each client knows that everyone within the organization is personally involved in assuring the best quality of service is provided. Comprehensive security officer supervision is unique to Secure Horizons Protective Service Inc. It is in our best interest to evaluate and regulate the performance of a security officer who is assigned to protect your property. Uniforms are an important part of a security program. Secure Horizons encourages officers to look their best at all times by providing high-quality uniforms and accessories included in each security officer wardrobe. Building entrance doors are checked to ensure that they are properly locked at the designated times. Entrance doors to tenant’s areas will be locked while at work and after the work is complete. Unauthorized persons will be denied access into the building or tenants' areas. Entrance doors will be double-checked after work is complete. Any key will be returned to proper personnel (supervisor) after work. Potentially hazardous situations will be diffused by removing combustible from sources of heat and shutting off coffee machines, stoves, fans, etc.